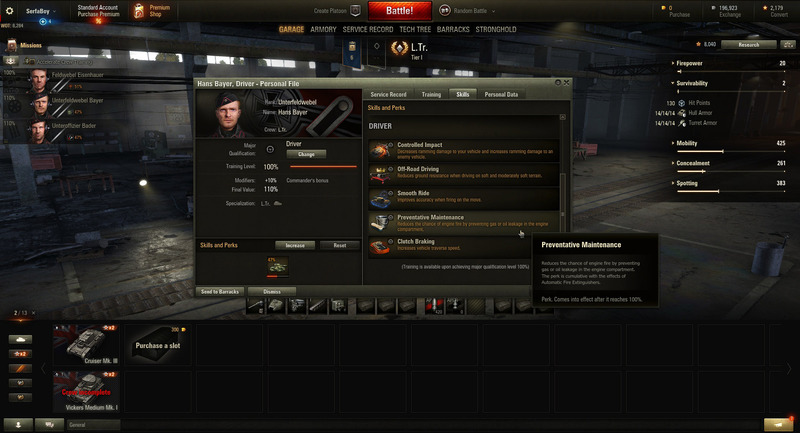 The Skills and Perks you should be training first in World of Tanks. 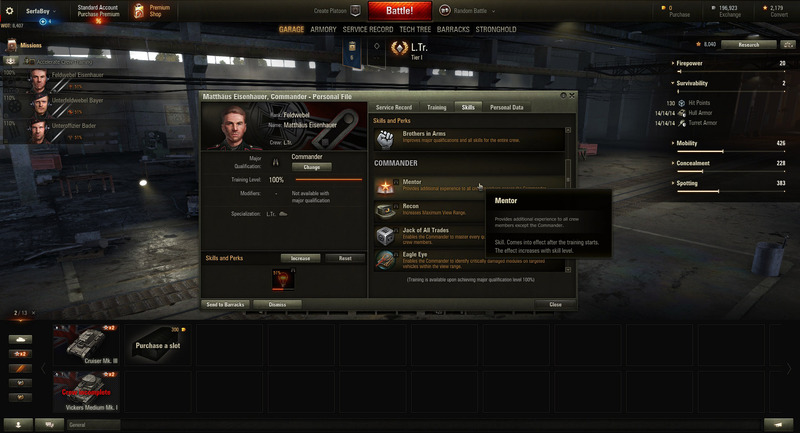 This guide will talk about what skills to train first in World of Tanks. When it comes to training crew members in World of Tanks, there are several options for what Skill or Perk to train first, and a lot of subjectivity surrounding which one is better than the other. While personal preference will play a strong hand in your decision, skills and perks can be grouped into levels of importance. Even then, a skill some consider to be unimportant will be vehemently defended by others, so always be open-minded when looking into your next skill! The Mentor skill is a must-have for new tankers as a Commander with Mentor will increase the training rate of all other crew members. Picking what skill to train first in World of Tanks is a relatively simple process, as there are a few “must-have” skills that are important to keep in mind. These skills should be trained as soon as possible, and will give you the best benefits for your tanking career. It’s important to pick the correct skill, as each subsequent skill requires more experience to train (resulting in a longer grind). This will include both Skills and Perks, as you can only train one at a time. 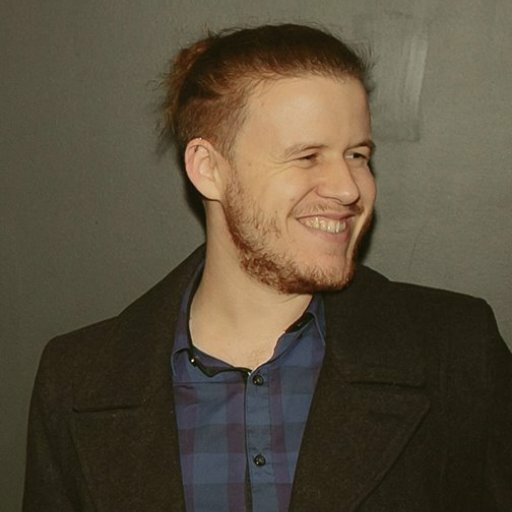 Keep in mind that Skills and Perks are different. A Skill is effective immediately but will only be fully effective once it reaches 100%, while a Perk won’t activate until it's 100% trained. For many players, Brothers in Arms and Sisterhood of Steel will be the first Perk they select for their crew (with the exception of Commanders). Brothers in Arms improves the Major Qualification and general skills of your crew by 5%, thereby increasing the effectiveness of subsequent skills or perks. Sixth Sense is an excellent choice for a Commander considering how their main role is that of spotting. Sixth Sense will alert you when you’ve been spotted, allowing you to make the decision of whether to push on or retreat. While this perk is useful on most tank types, Heavy tanks rarely find a use for this skill as they're typically always in the line of fire. Concealment or “Camouflage” is a skill that increases your camouflage values, making it difficult for an enemy vehicle to spot you. This perk is extremely useful for Light tanks in a passive scouting role, Tank Destroyers, and SPGs. Be sure to read more on how concealment works to have a better understanding of how to exploit this mechanic. Repair can be trained by any crew member, making it a worthwhile and easy investment. The Repair skill increases the speed at which your tank is repaired, which is an absolute must for Heavy and Medium tanks. In a nutshell, Repair is great for any armored vehicle that will be spending its time in close proximity to the enemy or dashing between locations, and is a worthwhile purchase on active scouts as well. Most of the "must-have" skills are found within the Commander crew member, as his role can have the greatest effect on the rest of the crew. The Recon skill is also worth training as it increases the view range of your tank. This is good on practically every tank, as seeing an enemy before they see you increases your odds of winning an engagement. Recon is also great for scouts and Tank Destroyers, because those that lack view range will often wind up firing blindly on an enemy's last known position. Many veteran tankers may forgo the Mentor skill, but for new tankers, it can be worth investing time into. This is because Mentor will help your other crew members train faster. Mentor grants additional XP for every crew member (besides the Commander), and will help you train skills and level new recruits. Safe Stowage is one of the few good Loader-specific Skills worth training. These skills and perks are solid picks, but are typically only worth training after you’ve cleared the six listed above. Alternatively, these are worth picking up sooner if you're chasing a specific, niche playstyle. In the end, it all comes down to personal preference once you become familiar with how World of Tanks works. After clearing your first tank line and beginning another, you may realize you prefer to take one of the following skills or perks before one of the previous items. Jack of All Trades is a Commander skill that allows him to replace an incapacitated crew member. Typically, when a crew member replaces another, they aren’t as effective. However, this skill circumvents that negative. A side effect of having Jack of All Trades is that it relieves the need for Med Kits, as the Commander can effectively fill the empty crew position. This Radio Operator skill increases the view range of your tank and can work in conjunction with the Commander’s Recon skill. As with Recon, Situational Awareness is useful on tanks that rely heavily upon their view range. Snap Shot improves accuracy when rotating the turret. This is useful if you’re tracking an enemy vehicle and a worthwhile skill on any tank. Armorer is a Gunner skill that improves the effectiveness of a damaged gun. Armorer is extremely useful on tanks with a larger turret, including certain Tank Destroyers. If your gun is always getting damaged, consider spending some time researching Armorer, especially if it’s noticeably affecting your accuracy. Improves the Durability of the ammo rack, helping to prevent it being damaged when hit. This is one of the only useful Loader Perks, so save this for when all the common Skills and Perks are researched. Deadeye is a Gunner Perk that increases the chances of damaging an enemy module and crew by 3%. This is extremely brutal on tanks that are able to fire out a lot of shells, such as autoloaders. While not essential, frontline tanks can use Deadeye to their advantage as an increase to module damage will help tip and engagement into your favor. Firefighting can be earned by all crew members and actively increases the speed at which they can put out a fire. While Firefighting isn’t as effective as some of the fire-related Consumables, it can free up the Consumable spot for those who tend not to get caught alight. Off-Road Driving is good for any Light or Medium vehicle that relies on being able to move swiftly, even across soft terrain. This Driver skill reduces your tank’s terrain resistance, making it easier for it to maneuver. This skill is more effective on soft or wet terrain than on medium terrain, and has no effect on hard terrain. Off-Road Driving is an extremely useful Skill for Light or Medium tanks that rely heavily on their speed to get them around the battlefield. Clutch Braking is a Driver skill the improves the hull traverse speed of a tank. This is extremely useful on heavy tanks, or vehicles who are fast but suffer when it comes to high-speed turning. Controlled Impact is a Driver skill that reduces the damage received when ramming while increasing the damage dealt to an enemy. Obviously this is most useful on Heavy or Medium tanks with strong frontal armor that can also pick up enough speed to warrant ramming. You can also consider using a Spall Liner to increase the effectiveness of this skill. 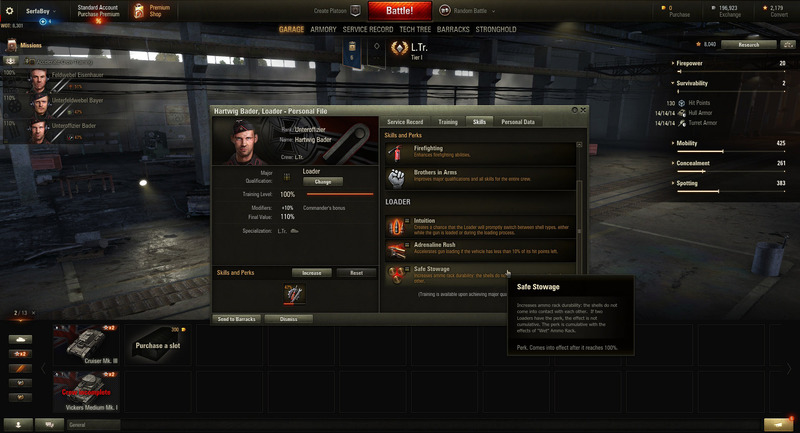 Rounding off the section of what skills to buy next in World of Tanks is Smooth Ride, a Driver skill that improves the accuracy of shots made while on the move. Consider training this skill on tanks that specialize in running circles around the enemies, or active scouts that may need to pop off a shot or two while zipping around the battlefield. Preventative Maintenance is only good on tanks with a high chance of engine fire, else it's rather unimportant. Finally, these skills and perks are only worth training if you have nothing else to select, or are specifically after a given ability that these skills and perks offer. Keep in mind, most of these skills offer little value outside of their niche. The Call for Vengeance Perk allows a Radio Operator to report on enemy positions for two seconds after your tank is destroyed. Call for Vengeance is only useful after your tank is destroyed. However, you never want to rely on your tank being destroyed. Preventative Maintenance reduces the chance of your engine catching fire, making it useless on a tank that doesn’t suffer from a susceptible engine. However, if you find your engine constantly catching on fire, either change how you play or consider training your Driver in this Perk. Adrenaline Rush is a Loader Perk that increases the reload speed when your vehicle has less than 10% of its health remaining. Again, another Perk that relies on your tank being almost completely destroyed, making is completely useless for the majority of a match. Never rely on your tank being destroyed, as you should always try to survive. 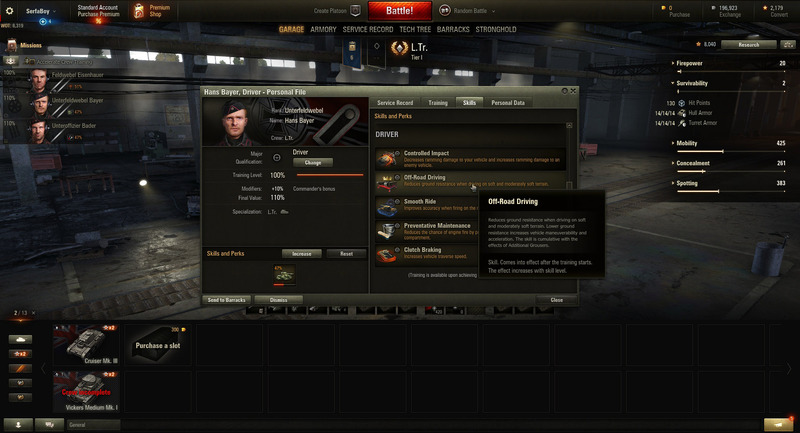 It’s better to try and improve at World of Tanks than to rely on a Perk such as this one. Only useful if you’re switching shells a lot, which is unlikely to happen if you’re a new player who doesn’t have the funds for Premium rounds. The Loader Perk gives you a chance that the when choosing to load a different shell type, the reload time will be over instantly. The Eagle Eye perk allows your Commander to identify critically damaged parts of an enemy vehicle. It's not worth the investment costs, meaning that you should try and pick another skill or perk. Designated Target makes enemies within 10 degrees of your reticle remain visible for an additional two seconds. This is only useful if you're the one spotting an enemy. However, it’s unlikely an enemy is going to be sitting in the open long enough for you to need an additional two seconds of spot time. Pick another Skill or Perk from this list. Signal Boosting is a Radio Operator skill that increases your vehicles Signal Range, not your View Range. Most high-tier tanks are able to stay in constant signal distance of one another while low-tier tanks will find more benefit from any of the previous skills or perks. Relaying is another Radio Operator skill that boosts Signal Range, but not your own, as it boosts your allies’ Signal Range. Don’t research this unless you absolutely have to. Picking Skills and Perks can be extremely subjective, but there are a few guidelines when it comes to selecting what skill to train first in World of Tanks. As you become more familiar with World of Tanks, you may even find you rely heavily on a skill we deem to be unimportant. Let us know in the comments what skills or perks you choose and which ones you always avoid!